A luxurious, small bathroom can be just as valuable and inviting as a larger bathroom. It’s pretty common for homes to feature small bathrooms, so we have come up with many great bathrooms designs that you can easily implement. Smart design elements and high-end materials are sure to make you forget all about any size concerns you may have. A small bathroom does not have to be cramped and cluttered. Implementing natural stone, bright tile, and peaceful colors throughout the room will make it feel more relaxing. A bright room is going to feel more open and clean, especially if you use the natural light of a skylight or high window. It might seem boring to use neutrals in other rooms, but the bathroom is the ideal setting for pastels and lighter shades. This gives the illusion of more space and natural sophistication. 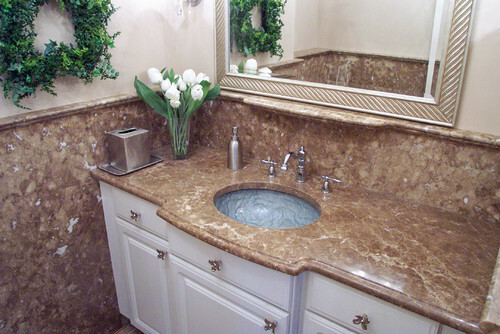 Consider bright marble countertops that will match any color touches that you choose for the rest of the room. Moderate room size provides the opportunity to purchase flooring and backsplash materials. It’s more difficult to afford upgrades in a large bathroom because there are so many square feet to cover. Invest in a backsplash or elegant flooring that you wouldn’t normally consider suitable for your budget. Too much blank or neutral space is easy to break up with the addition of colorful features. Take advantage of the area above the toilet or a blank wall by adding colorful cabinets for additional storage. Spruce up your vanity or old drawers with fun paint colors or adhesive tape. 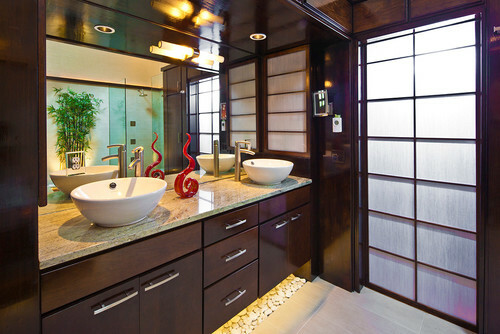 Reflective surfaces partnered with natural light is always a great idea for the bathroom. If there’s no room to add another window, hang a few mirrors to create a similar feature. Also, replace the basic shower curtain with a glass door to make the space appear more open. The standard swinging door is taking up unnecessary space that you could be using. A pocket door slides into the wall when not used so it’s completely out of the way. You’ll still have the same level of privacy without all of the waste. A spacious sink with storage underneath is a bit bulky, especially in a small room. 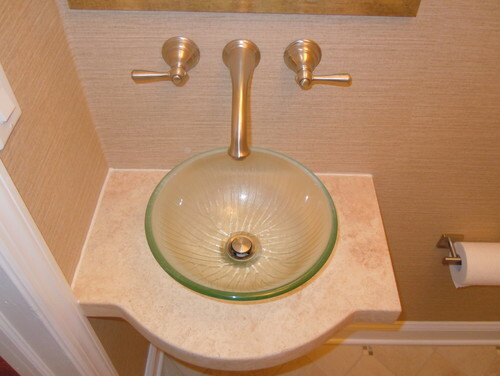 The pedestal sink is a very attractive alternative that takes up very little space. Add simple skirting to hide the ugly hardware and make the entire sink more stylish. There are a lot of great ideas that will help you achieve greater satisfaction with your bathroom, no matter how small the space. Call to set up a visit so that we can get a look at your space and help you discover the upgrade potential.